2011. By Jeffrey Warda (editor), Dr. Franziska Frey, Dawn, Heller, Dan Kushel, Timothy Vitale, and Gawain Weaver. Softcover, with wraparound internal spiral binding to lay flat. 224 pages. 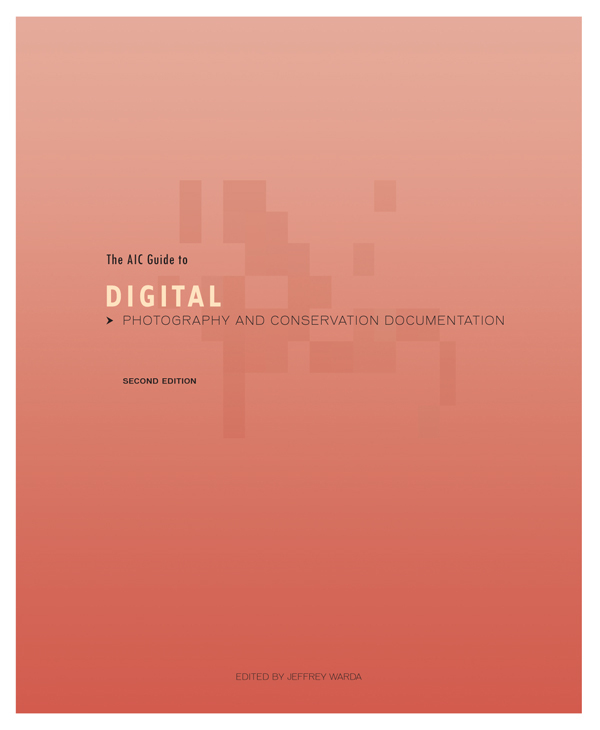 This greatly expanded second edition of the AIC Guide to Digital Photography and Conservation Documentation includes major additions to the text and is fully illustrated with more than 120 color figures. Complete updates to the text have been added throughout, including recommendations on the use of Adobe Photoshop Lightroom and a greatly expanded chapter on storage and backup of electronic records. Chapter 6 on Photographic Techniques for Conservation has also been expanded - principally in regard to Infrared and Ultraviolet Photography. This edition also includes nearly 40 pages of detailed screenshot instructions in the Appendix that fully illustrate sample photography workflows in Adobe Photoshop and Adobe Lightroom. See more about this book at www.conservation-us.org/aic-digital-guide. Note that an electronic version of this book (3rd Edition, 2017) is available via the link above.